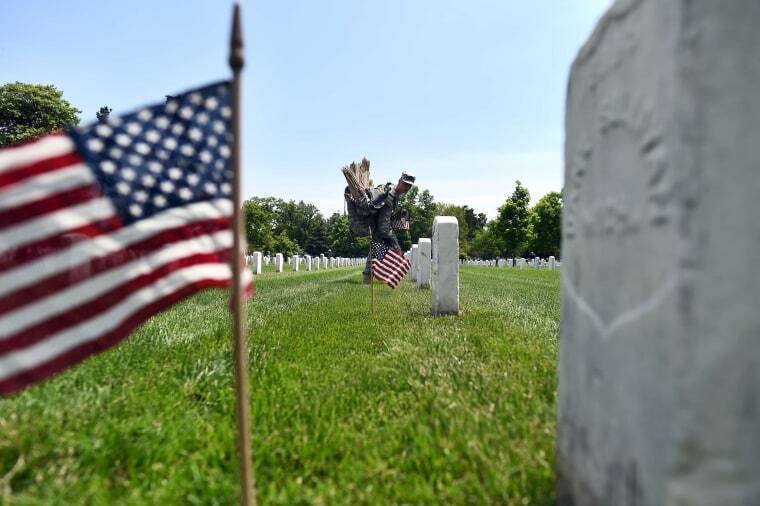 The nation is marking Memorial Day weekend with somber ceremonies, flag planting at cemeteries and parades. In New York, a Marines Corps chaplain will give a sermon Sunday at the Marble Collegiate College in Manhattan. Afterward, sailors, marines and Coast Guard members in town for Fleet Week will tie memorial ribbons on the church's fence. In the Los Angeles area on Monday, some 3,000 red and white carnations are dropped by a B-25 aircraft owned by the Palm Springs Air Museum. On Saturday, Democratic congresswoman Tammy Duckworth served as grand marshal of Chicago's Memorial Day Parade. She lost her legs while serving her country in the Iraq War. In Massachusetts, a Boston Marathon survivor and his rescuer helped plant tens of thousands of flags at a ceremony to honor veterans.